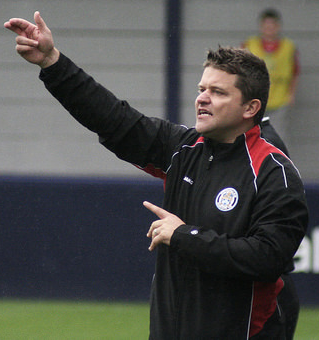 After making 78 appearances for the club at the end of his playing days, Scott initially took over as caretaker alogside Steve Halford at the end of the 2010/11 season with the Tigers facing relegation from the Conference North. But after winning two and drawing three of the fives games left, mission impossible was completed. Much to the surprise of many supporters, McNiven and Halford were overlooked for the permanant role and Scott took up a coaching role with AFC Fylde. Twelve months on, after Gary Lowe stepped down, Scott was given the task of being Hyde's manager for their first ever season in the Conference Premier and against all the odds he kept us up, a run of five straight wins in March 2013 being key to that success. The following season was one to forget however with just one triumph in the league and a league record lowest points total of ten. A return to the Conference North did not lead to consolidation with The Tigers quickly reaching bottom place once again, a 7-1 reverse at Stalybridge Celtic on New Years Day being the final act of Scott's time in charge.